In a study performed in 2013, 27.4% of people will start to experience backpain within the first 3 hours of working consecutively. 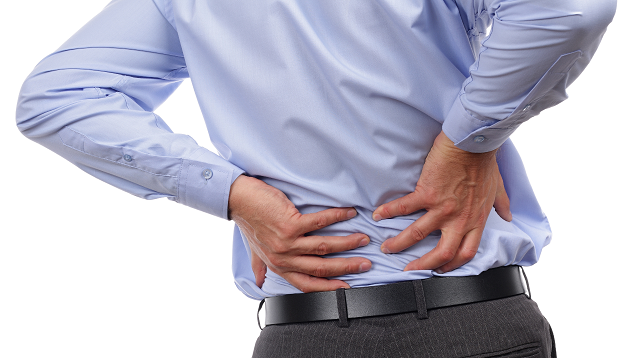 Taking short breaks is a major contributor to the reduction and prevention of back pain. When working for long periods of time, gravity starts to weigh down on the body. While the support structure of the spine certainly helps to keep you upright, over time the supportive muscles start to tire and fatigue. This is usually experienced as aches and pains in the lower, middle and upper back. By taking a short break, you’re allowing the muscles to loosen up. Circulation improves, providing nutrient-rich blood to the areas of the back that have been stagnant. Usually a quick 2-3 minute break is all you need to refreshen the back and spine. Use this time to grab a cup of coffee, get a bit of sunshine, or chat with a co-worker. 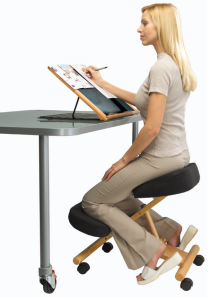 Look into purchasing a chair that will encourage you to keep proper posture while you’re sat down at your desk. When you sit up straight, you’re leveraging the robust structure of the spine to keep you upright. On the contrary, when you slouch, the muscles have to work to keep you upright, which ultimately results in back pain. A proper ergonomic chair encourages you to sit up straight. Many chairs are built for comfort, which is usually perceived as a reclining position. While this may be comfortable in the short term, in the long run, the lack of posture and core development will likely result in spinal issues. These days many chiropractors are recommending alternative chair designs that lack a back rest feature, such as kneeling chairs and exercise ball chairs. With the absence of a back rest, the body is required to sit up straight as it cannot rely on the back rest to keep it up right. The body’s natural resting position, when unaided, is perfect posture. When the vertebrae stack on one another, the least amount of exertion is required. Often, office furniture expenses don’t need to come out of your pocket. Most businesses recognize the importance of keeping their employees healthy and assisting them in avoiding time off due to injury. Check with your HR department to see what kind of assistance they have available. Staying hydrated improves circulation and helps to supply the muscles with nutrients. This allows them to stay supple, limber, and prevents them from locking up and spasming. Often when you experience a headache due to neck cramping, this is a likely culprit. Read more here. Office settings are typically dehydrating environments. The AC is constantly running and we’re sipping dehydrating coffee and sodas to keep energized. It thus becomes extremely important to stay hydrated. Make sure to at least drink a proper 8 glasses of water per day. Your back will be much happier if you do.